High Speed One opened in 2009 and is transforming Kent’s economy. Or is it? A Kent Design seminar in May 2014 explored this question with planning and transport experts, exploring the facts and looking at the implications for spatial planning. It transpires that the picture is complex, with parts of the county performing very differently, and that high speed rail has yet to meet its full potential. The session, chaired by Chris Lamb of Design South East and sponsored by Peter Brett Associates, opened with inside views from the main rail operator and the network. Peter Stapleton, Head of Facilities and Projects and Nina Peak, Partnerships at South East said that HS1 had confounded the sceptics, showing “phenomenal growth” since the launch and with some peak services already approaching capacity. Journeys made by high speed had increased by 16% over the six year period, but with a remarkable 60% in East Kent and Dover. Growth in passenger numbers was expected to continue, fuelled by long distance commuting, more housebuilding and a shift to rail from other forms of transport. Tourism too was benefitting, with passenger numbers up in Margate and Canterbury, which in turn had justified investment in new stations and an improved public realm, including Canterbury West and Dover Priory. The downside? Growth on the ‘slow’ lines has been modest, and offset by the shift to high speed. An early warning was given about the massive and unavoidable disruption that will come with the rebuilding of London Bridge station up to 2018. Richard Howkins, Senior Strategic Planner at Network Raildescribed the complexities of the Kent rail network, with four operators were feeding into six London termini and using a web of lines that were mostly 19th century in origin. The Kent services were part of one of the most complex networks in the world, with South Eastern alone running 2,000 services a day, for 600,000 passengers. The challenges to improved connectivity were formidable, not helped by the in-built inefficiency of a commuter-driven service, with rolling stock under-used outside peak times or when going against the flow. The reality of network investment was that there would always be different aspirations amongst stakeholders, and major capital projects had long lead-in times; this posed the dilemma of meeting today’s challenges but not tomorrow’s problems. Nonetheless there was an ambitious investment programme, notably through Crossrail and Thameslink but also by lengthening platforms and running longer trains. Recognising the needs of people working on trains, high speed broadband was being rolled out nationally. The plan to extend Crossrail from Kent to Canary Wharf via London Bridge was an exciting prospect. There were key drivers for this investment, such as the growth of the Kent Gateway, Ebbsfleet and Ashford. 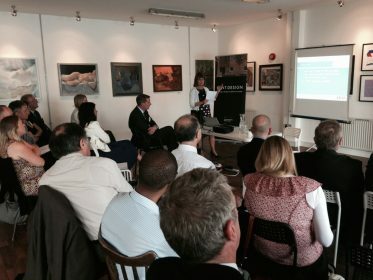 Mandy Bearne, Director of Marketing at Locate in Kentintroduced the business consumer perspective and had no doubt about the benefits of high speed rail. HS1 had removed the barrier, commonly stated in business surveys before 2009, that Kent was poorly served by rail and business was isolated from its markets. Companies large and small were undoubtedly taking advantage of close connections with central London; they were now able to compete on equal terms with companies within the M25, with the heart of the capital being only 18 minutes from Ebbsfleet, 38 minutes from Ashford. The European connection was also evident; not simply access to Paris and Brussels, but the strong market for language skills in Kent. Professor John Worthington, Director of the Academy of Urbanism, spoke about his work with the Independent Transport Commission and his review of the spatial impact of high speed rail. The ITC is a research charity supported by a range of public and private sector bodies and was well placed to test the relationships between planning and land use. Pursuing the European theme, John pointed out that London and the South East was now part of a trans-channel economic powerhouse, including Benelux, the northern Ruhr and parts of France, covering some 60m people. High speed rail was providing a vital mesh between centres. London itself was now a global mega-city with a catchment of up to 130m. The old concentric model of cities ringed with station termini was outdated; we now need to cross cities as easily as we can travel between them. The implications and the potential of rail travel were improperly understood; if not by the transport industry, then certainly by politicians and perhaps some investors. The real challenge to connectivity was not high speedtrains so much as high speed (or at least convenient) travel, which embraced the full journey, door to door. Local connections were vital. Long term vision was vital, and the need to be flexible enough to allow for cities to grow organically and to adapt. Mobile devices and apps were changing the way people thought about and used cities and transport, but they also presented invisible barriers such as the national restrictions built into some search engines. The long term view, and investor patience, was also necessary; it had taken Lille 15 years to reap the rewards of high speed rail service and hub. Stations were themselves destinations and places of connection, often being the busiest places in town. Yet they also have to deal with separation – the severance caused in the urban fabric through an often impermeable barrier. The crucial role of designers in infrastructure projects and their public responsibility was demonstrated by Laura Kidd, Head of Architecture at HS2. Laura was the only architect directly employed by HS2 but was supported by an array of consultants, including several leading practices. HS2 would be constructed in two phases, with the first being London to Birmingham and followed by the ‘Y’ branch to Manchester, Leeds and possibly Scotland. Design work had yet to begin in earnest and published images have been speculative. However, two common themes would be the importance of contextual design and the emphasis on the public realm; the stations and the lines needed to serve the whole of the community, not just users of the services. One of the biggest challenges would be at Old Oak Common, Acton – a 155 acre site, supporting some 19,000 homes and 90,000 jobs, phased over 30 years. In a lively and provocative talk, Tim Allen, Partner at Peter Brett Associates warned about relying too much on forecasts for infrastructure delivery. The old ‘predict and supply’ model had been discredited by some unforeseen events: economic boom and bust, technological advances and simply the unintended consequences of human behaviour. Value engineering, not an unworthy aim in itself, was too often counterproductive and resulted in short life, inflexible outcomes. There was a risk of “death by cost-benefit analysis”. In arguing for a new ‘equilibrium’ model for infrastructure investment, Tim contrasted modern convention with some salutary historical precedents. Canterbury Cathedral was a huge project for its Norman creators, built without a brief or a forecast, yet after 900 years the building was still fulfilling meeting its original purpose. The birth of modern British infrastructure could perhaps be traced to 18th century and Ironbridge, where a technological advance was deployed to cross a river gorge and thereby generate toll revenue. Similarly, almost the whole of the UK modern rail network had been built by private treaty between landowners and competing commercial operators rather than working to a grand plan. The regenerative effects of HS1 had been exaggerated. Whilst some places on the line had undoubtedly benefitted, the effect across the whole of Kent was much less compelling. The lesson would seem to be that rather than using infrastructure to meet anticipated demand, it was a better bet to look for the opportunities that would be created.